A reader comment last week sent me on a short wild goose chase, that had an interesting and useful conclusion. 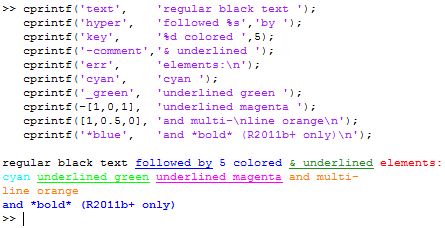 The comment requested a way to display bold text in the Command Window, similarly to the way that we can display colored and underlined text using my cprintf utility. Since Matlab release 7.13 (R2011b), the Matlab Command Window (CW) has the ability to display bold text. This is used, for example, when displaying the function name in the output of the help function (i.e., help(‘max’) will display the term ‘max’ in bold when displaying the help section). It therefore seemed a reasonable request to add this functionality to cprintf. I stated out investigating the relevant attributes used by the CW’s underlying Java component to display the text. 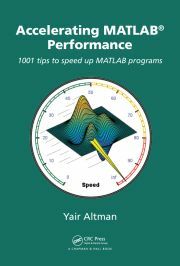 It turns out that in addition to the three custom attributes used by Matlab in past releases, a fourth attribute called BoldStartTokens was added, which stored the relative position index of the bold text within each text element. Unfortunately, this attribute contains an array of integer values, that get converted to a simple numeric array in Matlab. This means that unlike the SyntaxTokens attribute, which contains an array of Java String objects that can be modified one at a time (this is used by cprintf), the BoldStartTokens attribute value cannot be modified in a similar manner. Attempting to remove and add the attribute afresh (with modified values) failed due to a javax.swing.text.StateInvariantError: Illegal cast to MutableAttributeSet Java exception. So unless I find a way to update the BoldStartTokens attribute values from Matlab, this looked like a dead end. My second attempt was to follow the Matlab trail, to see exactly what the help function does internally to format parts of the text as bold. Starting with help‘s m-file (%matlabroot%/toolbox/matlab/helptools/help.m), and step-by-step debugging, I quickly found out that the internal function prepareHelpForDisplay parses the help text and wraps the relevant terms with an HTML <strong> tag to make these terms appear bold. Matlab does have an internal limitation, of not allowing hyperlinks and bold formatting together. If both <a> and <strong> tags are present, then only the inner tag set is parsed. Please feel free to download cprintf from the File Exchange and read its contents to see how a not-too-large utility can achieve something previously believed to be impossible. And if you find ways to make cprintf better, please do let me know (I don’t mean suggestions for *me* to work on: I mean actual improvements that *you* made to the code). It is important to say that using the s t r o n g> HTML tag as in your example with fprintf will only work in MATLAB environment. In a standalone mode , the DOS command window will display the HTML tags … so my advise would be to use this feature only if the MATLAB code is not expected to be compiled . Arash Marashian (13 days 4 hours ago): Problem Solved. I found out that my version does not have this icon. thanks. Marshall (14 days 7 hours ago): This was a fun puzzle–don’t hesitate to add more posts like these if you come across some other fun ones! Reza (14 days 13 hours ago): I have the same problem. this Java widget got error in compiling via Matlab 2018! Could you please show me how to solve this? GGa (16 days 7 hours ago): There isn’t anything “outside the UTF-8 range”. UTF-8 can represent any Unicode character, as far as I know.